When you are a make-to-order manufacturer, your customers are king. You all know the situation of having an already full schedule when a machine goes down, and your top customer calls asking for an urgent delivery. He expects an immediate delivery date confirmation. How to get a fast and reliable answer? just plan it helps you keep and win customers with maximizing your throughput and improving your delivery time commitments. Job shop scheduling and machine shop scheduling made simple. Improve your scheduling transparency and understand your job shop schedule and machine shop schedule. just plan it empowers SMB make-to-order companies and job shops to increase delivery time commitments. just plan it is a visual production scheduling application built for production planers and SMB business owners. It provides you with an easy-to-understand schedule - with both a jobs-centric and a resource-oriented view. 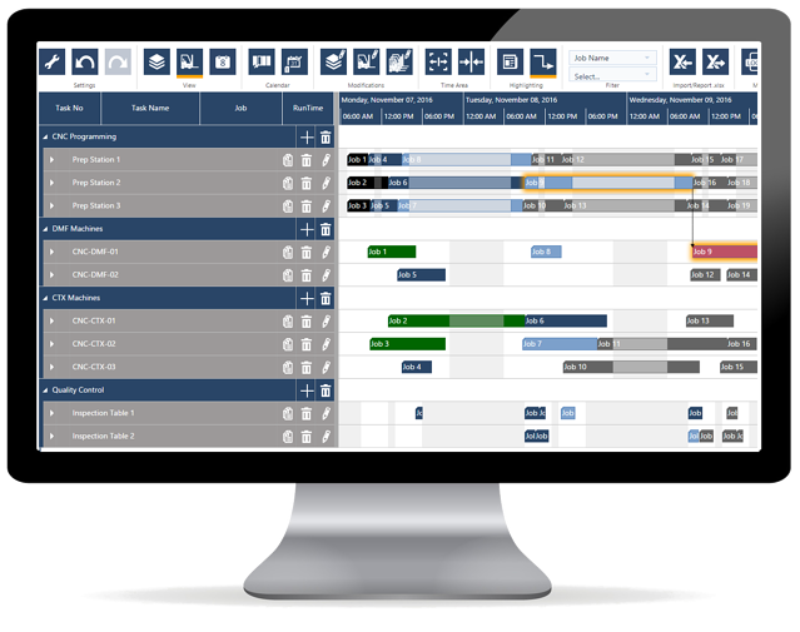 The clear and fully customizable color coding lets you understand your schedule, your issues, late jobs and bottlenecks at a glance. In the second you add a new job, you see when it will be ready given the current workload. Then you can reschedule with just a few clicks and communicate the expected finish date to your customer. just plan it combines state-of-the-art scheduling techniques with advanced visual scheduling concepts. This allows agile actions in case of unplanned incidents. In addition to this, just plan it provides you with the option to integrate real-time shopfloor data into the visual schedule. With this, you can base all your decisions on an always-current schedule. 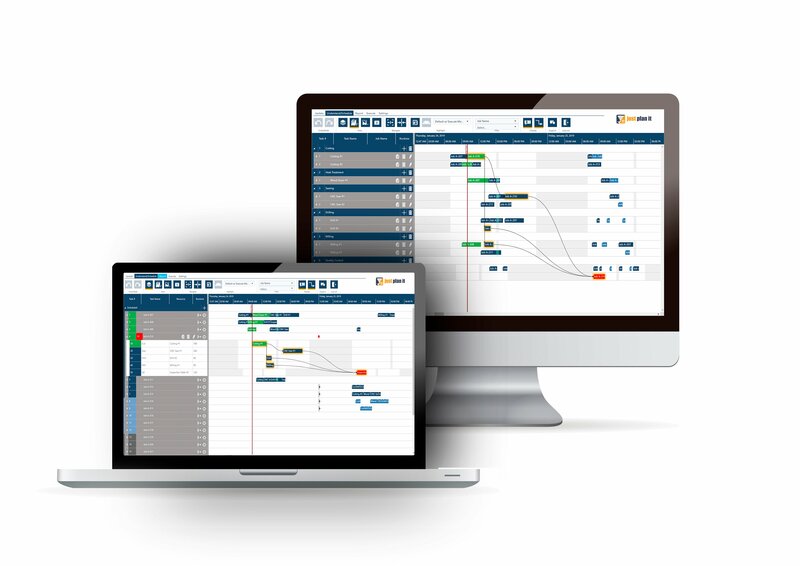 The Gantt chart based visual scheduling approach empowers the planner to easily manage the production schedule. just plan it comes with a jobs-centric Gantt chart and a resource Gantt chart. This makes your schedule easy-to-understand. just plan it is a visual scheduling application built for production planers and SMB business owners. It is powered by a scheduling engine that achieves an automatic priority-based finite capacity scheduling. This allows agile actions in case of unplanned incidents even with complex data. just plan it lets different types of users collaborate on your schedule: Your operators can report actual data with an app-style experience on the fly. Planners approve these data, which automatically updates the schedule with shopfloor data, and which always keeps the schedule current. just plan it comes with a standard interface to Microsoft Excel. Upload your data with a few clicks. In addition to this, we have an app to integrate with Dynamics 365 Business Central and can quickly achieve an integration to any other ERP system. We really like the easy drag and drop functions and the fact that the plan is so visible. ANDREW GOLD, Ciovita (Pty) Ltd. This solution is just perfect for scheduling small and medium shops! Just Plan it is a simple yet powerful scheduling software. A versatile and simply maintained product has transformed our Production Scheduling. JONATHAN STENT, GIRO ENGINEERING LTD. Rated with 5 stars on Capterra. Pay us as you use just plan it. You can chose if you want to pay us monthly or annually. Our subscription fees are per plant, and you can add as many users as you like to one plant's account. No hidden cost drivers. Also, we are proud to offer you a lifelong price guarantee. We feel that this is a big plus. just plan it provides you with an easy production scheduling. However, scheduling itself never is easy. We provide a lot self-learning material. However, we also can take your hand and help with our on-boarding service. Get your scheduling coach and let us help you get up and running with just plan it. just plan it is not built by a start-up company, which might no longer be around tomorrow. It is built by NETRONIC - The Gantt Solutions Company. As German company we bring more than 40 years experience in developing visual planning & scheduling software. A reliable scheduling tool is your key to a successful manufacturing operations. Stop working with manual systems, or with Excel.